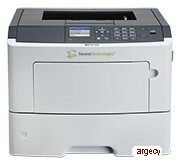 IPDS MICR Printers use both types of toner. They do not have the security features or fonts like our secure device. Meet the ST9720: A genuine performer with enhanced security in a budget-friendly package for secure MICR printing. Keep productivity at peak performance with the ST9720, a network-ready secure MICR printer featuring time-to-first-page as fast as 6.5 seconds and high quality print speeds up to 50 ppm on letter-sized paper. You-?ll be pleasantly surprised at all the features packed into this powerful printer, including an impressive 800 MHz processor, 256MB of standard memory and integrated duplex printing. The 2.4" color display keeps your information prominent, and the front-loading supplies, a single-sheet priority feeder, and the addition of an optional paper drawer increase the ease-of-use. 1Up to this value at 5% coverage. Average standard page yield value declared in accordance with ISO/IEC 19752.